I've been reading Paul Tillich for a class I'm taking here at Princeton with Dr. Mark Taylor. 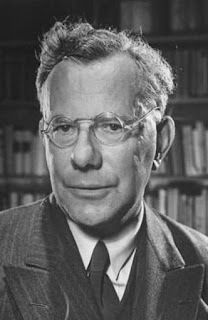 In the past I haven't thought much of Tillich, indeed I haven't even thought about him. But this semester I'm being plunged into his thought at full speed. With my Moltmannian lenses on, I've been reading Tillich with an eye out for his perspective on God's agency in/over creation and history. God is, for Tillich as "the ground of being," the "religious depth" of culture and the "ultimate concern" of human experience. In other words, God is not primarily to be thought of as a supernatural entity, a being existing with other beings, but as the true significant content of reality - in God "we live and move and have our being" (Acts 17:28). But is God, for Tillich, an inanimate concept with no personality, passively being as the depth of all things that do have personality, agency, and intention? Does God act upon culture and creation even as God is within and at the depth of creation and culture? What's God's job description? With this eye open, I was excited as I approached his quote on page 34 of The Courage To Be: "The ground of everything that is [God] is not a dead identity without movement and becoming; it is a living creativity." Great! God is about to take action. Now, if you're looking for direct, disruptive, and imposing action, this is something of a let-down. Finally we see how and to what extent God, the ground of being, takes creative action in reality. Finally we get a window into what God is up to in the narrative of Tillich's thought... and the extent of this action essentially amounts to the affirmation of God's own being. God's job description is... to be?! This struck me, initially, as disappointing and even anticlimactic. The implication, again, is that God isn't really up to anything but passive being. Culture is the dynamic main character in the story—culture's search for its own depth—and God is the ambiguous 'moral of the story,' the lesson waiting to be learned. But is my initial disappointment really merited? Is this job description of being really so passive? To be fair to Tillich, his concept of being is a lot more robust than that. Being itself is intrinsically active and creative, not passive, when you take into account the actual conditions necessary for such existence. In the face of all the threats of chaos, injustice, anxiety and what Tillich calls "nonbeing" it actually takes a lot of courage to be. In a world which essentially refuses to let God be God, God's self-affirmation intrinsically involves creativity and agency to create the conditions necessary for being in the face of opposing forces of anxiety and eventually despair. While Tillich does not speak as explicitly about God's freedom and agency in the work of reconciliation—even atonement—as I may like, these actions may be implied if indeed they are actions which create the conditions necessary for self-affirmation and divine self-affirmation. Being presupposes as much freedom and agency as it takes to create conditions for the kind of being that is truly in sync with who God is and what the world is really like in its essence (affirmed as "good" from the first day of creation). "After the Philistines had captured the ark of God, they took it from Ebenezer to Ashdod. Then they carried the ark into Dagon’s temple and set it beside Dagon. When the people of Ashdod rose early the next day, there was Dagon, fallen on his face on the ground before the ark of the Lord! They took Dagon and put him back in his place. But the following morning when they rose, there was Dagon, fallen on his face on the ground before the ark of the Lord! His head and hands had been broken off and were lying on the threshold; only his body remained... The Lord’s hand was heavy on the people of Ashdod and its vicinity; he brought devastation on them and afflicted them with tumors. When the people of Ashdod saw what was happening, they said, “The ark of the god of Israel must not stay here with us, because his hand is heavy on us and on Dagon our god" (1 Samuel 5:1-7). God's action in this passage is not explicit, it can even initially be perceived as passive, but it is no less decisive. There's no narrative description of God breaking the idol of Dagon, but nevertheless, the idol is broken and its worshipers are discomforted. God's presence, God's being, simply creates the conditions necessary for God to have God's rightful place, the conditions for God's self-affirmation. God's being does not passively accept things as they are but disrupts opposition, conquering God's own nonbeing, actively ordering things to their essential being. In this case, the idol which laid claim over the people was broken and its worshipers were discomforted. This is the season of Lent. The season of Lent is about following Jesus to the cross. It is about discomforting ourselves and breaking the idols which lay claim over us. It's about giving up distractions and shaping ourselves according to who we are truly invited and created to be in Christ. In Tillichian terms, it is about "participation in the universal or divine act of self-affirmation" (23). It is about creating the conditions necessary for God to be God in our lives and in God's own life. According to this pattern of participation it is for us to be ourselves without deceiving ourselves; taking on all of our anxiety, finitude, and imperfection as the mark of ash upon our heads draws us to creatively embrace our own nonbeing and the anxiety of our existence. Being, we discover in Lent, is a creative activity which necessitates courage and even resistance. So, in the end, self-affirmation is a pretty good job description - for God and for us. For God to be God and for us to recognize God as the true ground of our being takes creativity, it takes agency, and it ultimately takes dependence as God's grace affirms our being in the midst of our nonbeing.